WASHINGTON — Thousands of troops will spend the Thanksgiving holiday deployed along the U.S.-Mexico border and a group of Democratic Senators is calling on the Trump administration to justify what they call a “politically-motivated mission” that wastes Pentagon resources. The Senators have written a sharply worded letter to Defense Secretary James Mattis, saying they are “deeply disturbed by the overt politicization of the military” and the continued deployment of troops in response to the migrant caravan. “This politically motivated mission misuses active duty service members and wastes Department of Defense (DOD) resources, both of which could compromise military readiness in the face of a true national security threat and heighten the risk of a confrontation between asylum-seekers and armed service members,” the letter states. Among those who signed the letter were Maryland Senators Ben Cardin and Chris Van Hollen. It is also signed by several Democrats considering presidential campaigns in 2020, including Sen. Corey Booker, D-NJ, Sen. Kamala Harris, D-CA, and Sen. Bernie Sanders, I-VT.
Democrats have been highly critical of the deployment of the troops, which President Trump called for ahead of the midterm elections. The president and Pentagon officials have said the response was needed because of a national security threat posed by the caravan, which has been making its way from Central America through Mexico. Thousands of migrants are now in the area around Tijuana. About 5,900 active-duty troops have been deployed in border states. The Pentagon said the price for their deployment has so far been $72 million. But when costs are added in with relation to 2,100 National Guard troops, who have been deployed in a separate mission since April, the costs are much greater. The Associated Press has obtained a report indicating the combined costs would be $210 million. Before leaving for Florida on Tuesday, President Trump was asked by a reporter if he had a message for a troops deployed during the Thanksgiving holiday. “Don’t worry about the Thanksgiving — these are tough people. They know what they’re doing and they’re great,” he said. 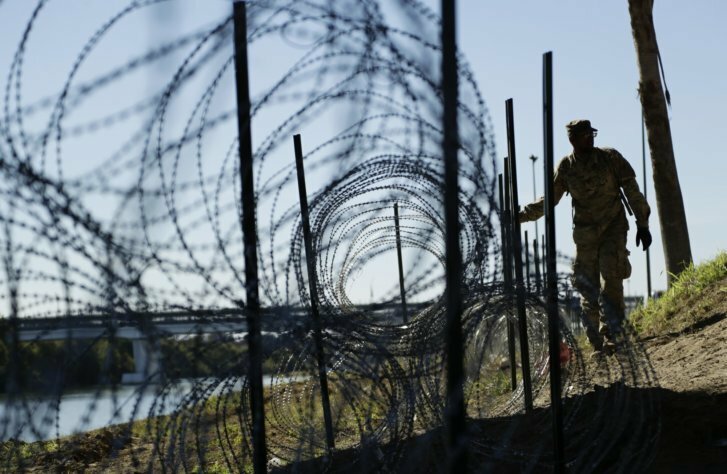 Lawmakers have asked Mattis to provide a final cost estimate for the troops’ deployment and measurements of their effectiveness along the border. They have asked that a briefing be scheduled no later than Dec. 6. Congress is facing a Dec. 7 deadline for approving the government’s latest spending plans and there are still questions about how much money lawmakers will provide for the border wall, which is a top priority for the president.